Today we were pleased to be able to complete the final claims for the i4Life project by posting the Form C cost claims to the European Commission. The i4Life project helped build both the infrastruture and content of Catalogue of Life, making it the world leading catalogue of living species. The catalogue was based at Reading University for 15 years during which it developed from a demonstrator project to a fully fledged information resource under funding from UK research councils and the European Union. The Catalogue of Life is now in the safe hands of Naturalis in the Netherlands who have committed institutional support for the project until 2018. 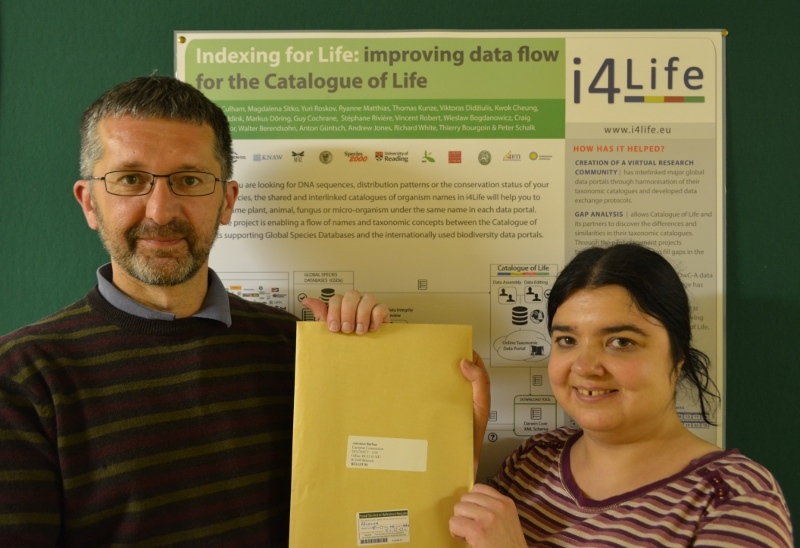 Becky Mann and Alastair Culham holding the envelope of completed Form C claims for the i4Life project. The i4Life project brought together 19 partners from Europe and the USA and developed new approaches to data movement within Catalogue of Life as well as linking the Catalogue to the world’s major biodiversity portals. It was graded ‘excellent’ in final review and has left a legacy of high level collaboration among its major partners and a desire to move forward in the mobilization of biodiversity and taxonomic data.